Previous PostTropica 1-2-Grow! plants. Have you tried them? !Next PostTropica Premium and Specialised Fertilisers – which one for my tank? Richard, I read the article on hair Algae on Moss which I have in my 125 Ltr Tank. To reduce the light intensity what would be best ,my lights are on 8hrs 3 in a morning 5 evening I also have Two Reflectors, should I remove the reflectors leave the lights at 8hrs or drop to 6hrs leave the reflectors where they are. I dose 5ml daily with Aqua Nourish and 2.5ml daily with Aqua Carbon would it be beneficial to increase the Carbon or leave that as it is. Yes remove the reflectors for the moment if you want to keep the lights on for 8 hours. However from an economical point of view, keep them on and run lighting for only 6 hours (cheaper). I would also increase your Nourish to 7-8ml and 5ml Aqua Carbon. This will help. Please keep me posted as to how your tank develops. Hi Richard, just an update on the progress of getting rid of the Algae on the moss in my tank. Have left reflectors on and dropped the lighting to 6hrs without a break and upped the ferts and carbon as you suggested, done this gradually,at first I seemed to get hair algae on other plants thought I might have done the wrong thing but over time that has reduced down to hardly any. The moss has had a good trim and it has improved, with the extra ferts all the plants are looking good so Thank You once again for your help. You persevered, got the right advice and BINGO, your plants have bounced back. I inject Co2 into my tank (250L) which is on a timmer and starts injecting into the tank 2 hours before the lights come on. I have a drop checker installed to measure Co2 and my lights are on for only 6 hours. Question: At what point, when your lights come on, should the color of your drop checker be? At present when my lights come on, the drop checker shows blue and by the time the lights go out it will be lime green. Is this right? In an ideal world David, when your lights come on, your drop checker should be green (or nearly green). This would mean your plants have the perfect CO2 levels so they can literally start growing straight away. So you either need to have your CO2 to come on earlier or your CO2 levels are too low in the first place (I suspect the latter). In most cases if you have your CO2 levels set up right, 1 hour should be sufficient to get your CO2 to the right level for optimum photosynthesis. How many bubbles per minute are you running your system at? Where in your tank is the location of your drop checker? Are you using a secondary circulation pump to move your CO2 around the tank? I have 800l , 80% plants 40% hair green algae. Ph6.5. 250w . What will be my next stap? You’ve seen our blog post on hair algae right? I read your article on hair algae and I tried some of the method but the hair algae seems to be growing strong. I have an odd size tank, 36″ x 5″ x 12″ (wall mount tank). I am on pressurized co2 (2-3 bps) I have been dosing Seachem Phosphorus, Nitrogen, Potassium and Comprehensive and daily supplement of excel, EI method and does weekly water change. My plants are HC, fissidens, anubias nana petite and hair grass. I have reduced my lighting to 5 hours a day, co2 is on 1hr before lights on. However, the hair algae situation did not improve. I see most of my plants pearl around my tank. I read on your article to increase water change, do I need to continue to add fertilizers after each water change? Currently dosing NPK on and Comprehensive on alternate days. I feel like I’m fighting a losing battle. What should my next step be? 1. Continue the 5hours period and reduce the intensity? 2. Do 2 time water change per week? 3. Blackout for three days? Are you using a drop checker with bromo blue? Which plants are suffering from hair algae? All or just some? I’m not using drop checker as I couldn’t get my hand on 4kh solution and if I use the tap water, it always yellow but the fishes show no sign of lack of o2. 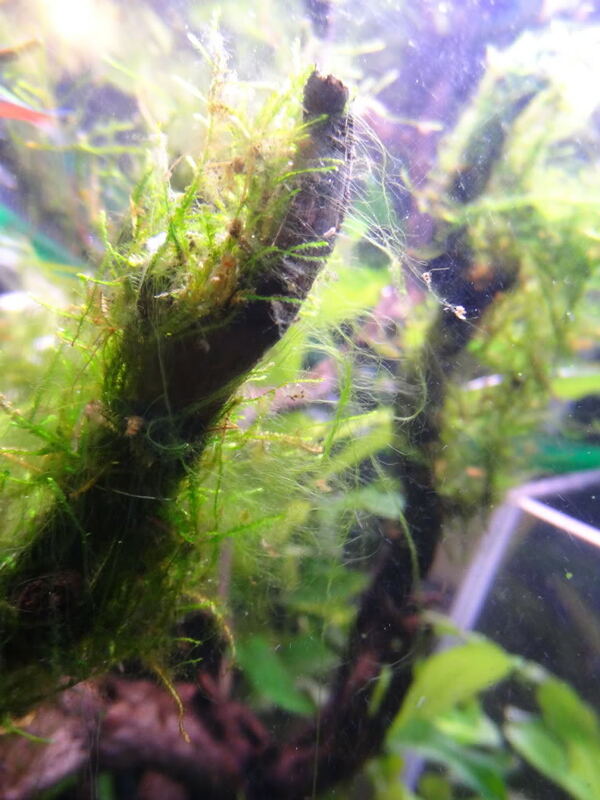 It started with Fissidens and now it has spread to HC, some rocks and Anubias and hair grass, basically everywhere now. It not as bad as it sounds, it just a few here and there but growing worst. I will try out the 3 x water changes and reduce the intensity of the light. Thanks for the advice, will update in a week’s time of the progress. In the meantime, if you have any other solution that you feel I should give it a shot, do let me know. If you’re not using a drop checker, you may as well just put your finger in the air and try and guess wind speed. It’s as simple as that. If you want to stop your algae from growing, buy a drop checker and bromo blue – both sold on our site. This will help you enormously and I look forward to your update. How about showing a picture too? Finally got the drop checker sorted out and you are right! It was not even green based on my last co2 configuration. I increased the co2 significantly (almost doubled the previous amount) and its very light green near to yellow at the end of the 5 hour light period. I increase the intensive of the lighting to normal and I noticed crazy pearling of all the plants at all areas, except one area which I will check the flow. Will observe if the hair algae situation improves over the next few days. You sound surprised I was right Alvin! Glad to see you’ve improved it and keep me posted on the hair algae. Hi dr. R, great thread. Been following the tips for over 2 weeks now,…. And really happy to say it is working! My next step is to add a load of amano shrimp to clear up the remaining hair algea, but my question is when / how should I start stepping the lighting back up? Ie. should I do this by going up 10% a week, etc? Good to hear about the shrimp. * increase the fertilizer – Im not sure how much I can increase it to and how often as bottle says twice weekly. Can you advise for this brand of Fertilizer please? * decrease the time the lights are on from 8 hrs to 6 hrs. Will this be enough lighting for my plants though – I thought they needed more light than this to do well? Sorry for all the questions but this is a new hobby (which I love). I Just want to be sure this is safe for the fish and if the plants will lose the algae over time or if I will still need to remove them and buy new ones. I’ve got a 240L heavily planted tank, run the lights on a six hour cycle, and the co2 an hour before lights on then off an hour before. I do a weekly 25% water change, I dose with ferts weekly too. My Co2 circulation is fine, my drop checkers all indicate a light greeny yellow. And with 2 externals and 2 internal power heads, I think my Co2 distribution is pretty good. My question is, can light intensity further promote hair algae grown. I suspend my 2 Kessil A150s about 7′ from the surface of the water, my tank is also quite shallow at 45cm. I also have some black algae on a handful of plants. Is that indicative of another underlying issue? I have a Shrimp tanks with Java and Christmas moss. I had to change 2 tanks due to green hair algae. even in new tanks it has started spreading fast.. Im sick and tired with them green hair algae. Light – 0.5 W LED strip ( 20 LEDs) daily 10 hours. Wow thank you for the write-up! I’m new to a Planted Co2 Aquarium and have recently got this problem . I will take all the advice given, eg: more water changes, manually removing hair algae, upping the Co2, I cannot lower the lighting but I can reduce the times. It comes on at 12-9pm. I donot use ferts or have a dirted tank. Just pump pressurized Co2, Aquarium dimensions are 18″h×18″w× 24″L. 147ltr/33g. Twin T8 fluorescent tubes, Fluval 306 canister filter. I will re-aquascape to improve water flow. I will check back in with you with my results after a week or 2. Plants are mostly Crypts, some Bucephalandra and Anubias, an unknown stem Plant that does well with banana Plants. Thank You!!! I’m having trouble with hair algae in a three week old 180l tank, stupidly i was leaving the light on for ten, yes ten! hours and obviously got hair algae. After searching the web for ages I came across your article and immediately reduced lighting to eight hour and upped my CO2 injection and ferts and did more water changes. My question is I’m two weeks into my new regime with no obvious difference, how long should the turn around take ? Hi I’ve just read this thread, trying to find a solution to my hair algae problem. I have a small 60ltr tank which is very heavily planted. I have slow growing Anubis, java fern, tiger lotus and a mixture of very fine grass and a small leafed carpeting plant (not sure the names sorry) which I was under the impression that it needed alot of light. Hair algae is spreading to most plant but mostly on the carpet and grass plants at the bottom. Last week I lost 4 cherry shrimp which was not good! So I did a huge water change and everything now seems fine. I did use an anti hair algae dosage (once a week for 2 weeks) which I have now stopped as I was worried this was the root of the problem although it does say it’s safe for shrimp..
Ive began doing a 20% water change 3 times a week. Before I was dosing ferts twice a week as recommended on the bottle and I only tended to run my co2 occasionally because my plants pear most days and my indicator shows a very bright yellow/orange which suggests there is a very high concentration of co2? After reading this I’m going to drastically reduce the light hours as I’ve been running for about 10hrs an day thinking my plants needed it. I’m hoping now with these changes I will see an improvement to the healt of the plants, but at this stage my biggest concern is health of my shrimp. If anyone has any advice on any of this then I’d be keen to know. It’s all fairly new to me.